The Faculty of Medicine is the second oldest medical school in South Asia and the forerunner of university education in this country. For nearly a century it was the only medical school in the island and its contribution to the health of the nation by way of providing health services, medical education and medical research is difficult to measure. In 1839, the Governor of Ceylon J.A. Stewart Mackenzie started sending Ceylonese students to Calcutta for medical studies, to the oldest medical school in South Asia – the Bengal Medical College. In the 1860s the Colonial Surgeon, Dr. James Loos was requested to report on the large depopulation of the Wanni. He recommended that medical facilities should be available throughout the island and to this end a medical school should be opened. 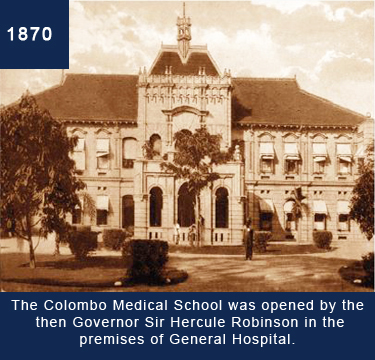 The Colombo Medical School was thus opened in 1870 by the then Governor Sir Hercule Robinson. 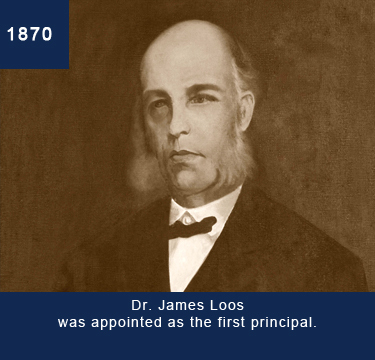 Dr. James Loos was its first principal. 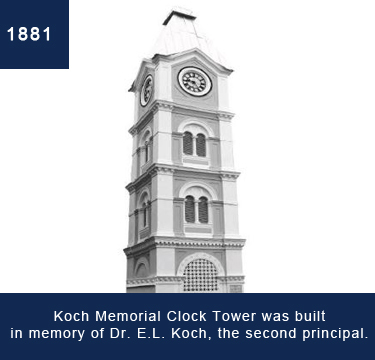 Dr. E.L. Koch was the second principal in whose memory the Koch memorial clock tower, which still stands, was built in 1881. The beginnings of the medical school were modest. It was situated in the General Hospital Colombo, and had three teachers and 25 students. It offered a course of three years duration, until in 1873 the course was extended to four years. Its progress was rapid. 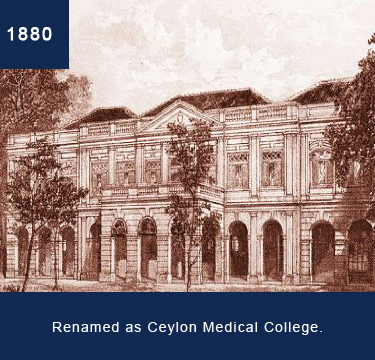 In 1880 the medical school was raised to the status of a college (renamed the Ceylon Medical College) and in 1884 the course was extended to 5 years. 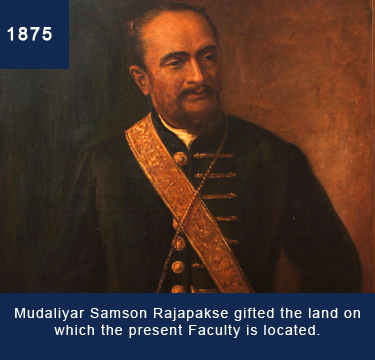 In 1875, Mudaliyar Samson Rajapakse gifted the land on which the present Faculty is located. Other philanthropists donated buildings at this site. These buildings are no more. The Anatomy block, built in 1913, is currently the oldest building. In 1887, the Diploma of Licentiate of Medicine and Surgery (LMS) granted by the College became registerble with the General Medical Council (GMC) of the United Kingdom. The Ceylon Medical College and the Ceylon University College, which had been established in 1921, formed the nucleus of the University of Ceylon, which came into being in 1942. The status of the Ceylon Medical College was elevated to the Faculty of Medicine of the University of Ceylon and the diploma of LMS was replaced by the MBBS degree. Until it became the Faculty of Medicine, the Medical College was administered by the Civil Medical Department and its successor, the Department of Medical and Sanitary Services. Dr. W.R. Kynsey served as Principal Civil Medical Officer (PCMO) between 1875 and 1897 and contributed much towards the college in its early years. 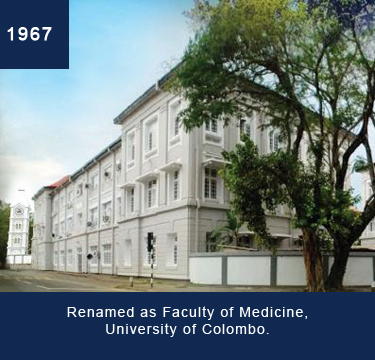 Kynsey Road, which runs between the National Hospital of Sri Lanka and the Faculty, is named after him. In 1942 the Faculty of Medicine had six Departments – Physiology, Anatomy, Pathology, Medicine, Obstetrics and Gynaecology, and Surgery. Departments of Public Health (Community Medicine) and Forensic Medicine were added in 1949 and 1951 respectively. At present there are 17 departments. The Departments of Biochemistry and Pharmacology branched off from the Department of Physiology, Parasitology and Microbiology from the Department of Pathology, and Paediatrics and Psychological Medicine from the Department of Medicine. In 2016, the Departments of Medical Education and Medical Humanities were added. In 1995 the MBBS curriculum was changed, and the present curriculum consists of 5 streams – Basic Sciences, Applied Sciences, Clinical Sciences, Behavioural Sciences, and Community Stream. With the initiation of the BSc Physiotherapy programme the Allied Health Sciences Unit was established in 2006, and the Department of Allied Health Sciences came into being in 2016. 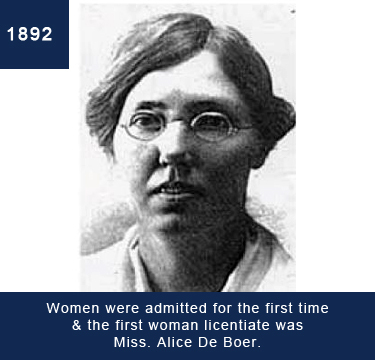 From 25 students in 1870, the student number increased to about 500 in the ’60s and is around 1400 at present. The staff strength too has increased to approximately 140 permanent academic staff, and over 150 consultants as extended Faculty.